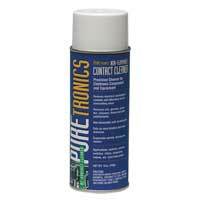 Non-Flammable Contact Cleaner - 16 oz. Restores electrical continuity of contacts found in electronic applications. Removes dirt, dust, fluxes, oxide particles and other contaminants. Non-flammable with no flash-point. Safe on electronics and most plastics (see middle panel). Evaporates quickly, leaving zero residue. Ozone friendly containing no CFCs and VOC compliant.